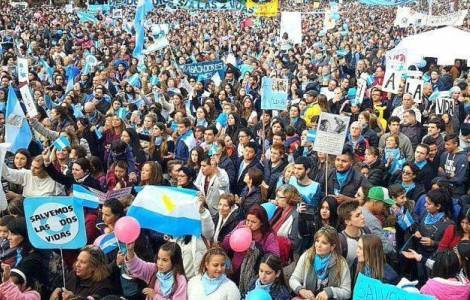 Buenos Aires (Agenzia Fides) - More than 300,000 people participated in the march that took place in the capital, Buenos Aires, on Saturday 23 March, to say "Yes to life" and to demand respect for this fundamental human right from the moment of conception. Similar events were held in about sixty cities in the country, involving Catholics, evangelicals, families and many young people. Cardinal Mario Aurelio Poli, Archbishop of Buenos Aires, will preside over the celebration of the Mass and will lead the prayer of the "Rosary for Life" this afternoon, March 25, in the Metropolitan Cathedral. All parish, religious and lay communities are invited on this day to attend Mass and recite the rosary according to the intention "To welcome life and treasure it as a sacred gift". On March 25, the liturgical feast of the Annunciation of the Lord, since 1999 the "Day of the unborn" is celebrated in Argentina. The first official celebration took place on March 25, 1999 at the initiative of the President of the Republic, Carlos Menem, supported by the Bishops' Conference. The institutional decree, which was signed on 8 December 1998, mentions the Universal Declaration of Human Rights and the Declaration of the Rights of the Child, stressing that "according to our constitution and our civil legislation, life begins at the moment of conception". The Episcopal Commission for life, the laity and family, of the Argentine Bishops' Conference, on the feast of St. Joseph, on March 19, published a declaration entitled "St. Joseph, guardian of life", in which he cited his example of "true groom, father and guardian of life". Recalling the Day of March 25, the text reaffirms "the inalienable right of every human being to be born", and urges to participate in the initiatives that will be held in different parts of the country for this circumstance: marches for life, prayer of the rosary and other celebrations. AMERICA/BOLIVIA - Bishops on religious freedom: "To recognize conscientious objection"